Made this Power Rangers Samuri Cake With Samuri Cupcakes for my husband’s little cousin Cooper (4). 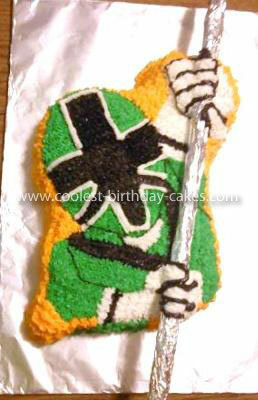 He wanted a power ranger cake, I didn’t even know Power Rangers still existed so I thought long and hard. I didn’t win the bid for the power ranger cake pan on eBay, so I purchased a spider man cake pan and thought really hard on how to make it work. I googled power rangers and found pics of the NEW power rangers, amazingly enough the only thing I had trouble with transforming a Spiderman cake into a power ranger were the hands. I freehanded the pattern and used extra long straws wrapped in tinfoil to make the samuri sword. It’s not perfect but I am really proud of it and thoroughly enjoyed making it. 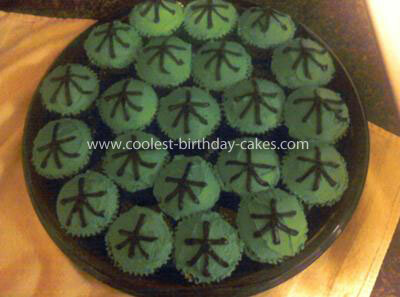 The cupcakes were inspired by the Japanese symbol portrayed on the Green Power Ranger Characters mask. This is just “Great”. I love the design and just knowing you did this yourself at home makes it that much more amazing. So i am thinking maybe i can make 2 of them each a different color as i need enough to feed about 35 people. I just hope mine turns out half as good as yours. Thanks so much for sharing this, it really is an awsome piece of work, very creative indeed. This is Awesome!! I’m going to have to copy you.. My nephew requested the green power ranger cake for his birthday this year and it just so happens I have the same spiderman cake pan you used from his b-day 2 yrs ago. I’m so excited. Thank u for sharing your great work! !